Progress for whom? The barbarity of social life and class relations in contemporary India were laid bare in Tuesday’s police massacre of working people demanding the closure of a copper smelter that has long befouled Tuticorin, Tamil Nadu, polluting its groundwater and environs with toxic chemicals. They deployed 1,500 police officers who quickly set upon the “illegal” demonstration, then resorted to deadly force when the bigger-than-anticipated crowd of 20,000 fought back. Violating their own procedures, police fired no warning shots and targeted those at the head of the protest for death. As video and eyewitness evidence and, most tellingly, the victims’ bodies attest, police snipers aimed for protesters’ heads and torsos, not their legs. 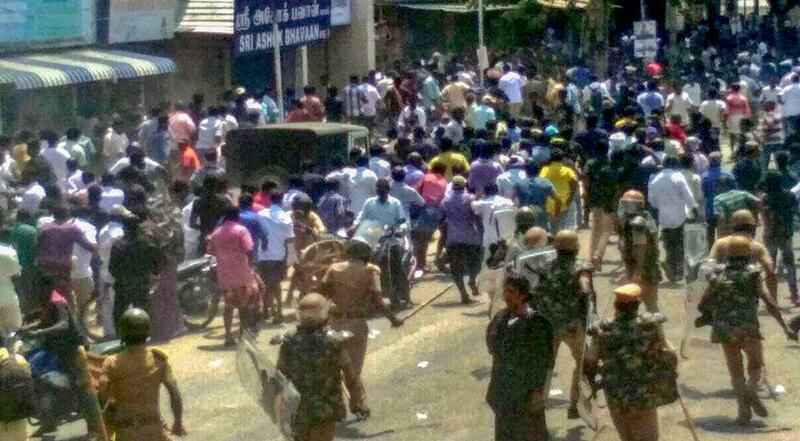 While people in Tamil Nadu and across India voiced outrage over the police’s actions, the Modi regime and Tamil Nadu’s AIADMK state government, a close ally of the BJP, quickly proclaimed the Tuticorin atrocity a necessary and proportionate use of force and plotted further repression and violence. This included: cutting off all access to social media and the Internet for five days in the state’s three southernmost districts, placing the paramilitary Central Reserve Police Force on standby for possible deployment in Tamil Nadu, and issuing ominous intelligence agency warnings of “leftist extremist” plans to use the popular outcry over the Tuticorin events to foment violence. The people of Tuticorin and fishermen in southeast Tamil Nadu have been protesting against the threat from sulphur dioxide, lead, arsenic and other toxins spewed from the Vedanta Resources’ smelter since it opened in 1996. Yet the authorities have been utterly impervious to their complaints. Vedanta and its proprietor, the multi-billionaire industrialist Anil Agrawal, have been given license to spew pollutants that have sickened and killed local residents and ravaged the pearl and fish industries off the shores of southeast Tamil Nadu. The trigger for the most recent agitation for the smelter’s closure was the government's authorization for Vedanta to double the Tuticorin smelter’s annual production capacity to 800,000 tonnes per year, which would make it the world's second largest copper smelter. In an attempt to mollify popular anger over Tuesday’s massacre, the Tamil Nadu government and courts have ordered the smelter shut indefinitely, with the Tamil Nadu Pollution Control Board demonstratively declaring that it has disconnected the smelter's power supply. But the Indian state and political elite have shown time and again that they are at the beck and call of Agrawal and India’s corporate elite and that they view environmental devastation and social misery as “the price of progress.” Sooner rather than later, they will green light the smelter’s reopening, just as they have on previous occasions when Vedanta's flouting of the most minimal environmental standards compelled them to order temporary production halts. Such social crimes abound across India. In its drive to make India a global cheap-labour production hub, the Indian bourgeoisie has pursued a socially incendiary agenda of privatization, deregulation and corporate tax cuts, while diverting state resources from health care, education and agricultural supports to big business infrastructure projects and the modernization and nuclearization of India’s armed forces. Mounting social opposition from India’s workers and toilers has been met with state repression and the stoking of communal reaction and noxious caste politics. Take the case of the 13 Maruti-Suzuki auto workers jailed for life on frame-up murder charges for daring to challenge the brutal cheap-labour regime that prevails in India’s new globally connected industries. State prosecutors and judges have publicly justified the savage class justice meted out to them on the grounds that their exemplary punishment is needed to reassure investors and advance Modi's “Make in India” campaign, which seeks to woo foreign capital to set up production in the country. A quarter-century of neo-liberal “reform” has transformed India into one of the most unequal societies in the world. While three quarters of all Indians eke out their existence on less than US$2 per day, the top 1 percent gorges on 23 percent of all income and 60 of the country’s entire wealth. there were just two Indian billionaires, now, according to Forbes, there are 131. This means India, which has a GDP little bigger than Canada’s, boasts the world’s third largest number of billionaires, having surpassed Germany, Britain and Russia. The Modi regime—a government that combines veneration of the capitalist market and personal enrichment with rabid communalism—is the culmination of this process of social plunder. India’s corporate elite, led by none other than its biggest billionaire, Mukesh Ambani, propelled Modi and his BJP to power in May 2014 to intensify the assault on the working class and more aggressively assert the Indian bourgeoisie’s great power ambitions. The four-year-old BJP government has accelerated pro-investor “reform,” slashed India’s already derisory social spending, and harnessed India to Washington's military-strategic offensive against China. While the vast mass of India’s population has been excluded from the benefits of India’s capitalist development, the process has given rise to a new and increasingly rebellious working class. The south Indian state of Tamil Nadu has experienced India’s most rapid urbanization over the past two decades and, not coincidentally, has emerged as a center of social opposition. According to the national Bureau of Police Research and Development, in 2016, the last year for which such statistics are available, Tamil Nadu had the second highest number of protests, be it strikes, demonstrations or anti-government meetings, of any state, an average of 47 per day. While the BJP and India’s corporate elite celebrate India’s “rise,” the reality is that the country is a social powder keg—one that is being roiled by mounting economic and geopolitical shocks emanating from the breakdown of world capitalism. That this mass social anger has yet to give rise to a conscious working class political challenge to the Modi regime and the Indian bourgeoisie as a whole is principally due to the political treachery of the Stalinist parliamentary parties—the Communist Party of India (Marxist) and its older, smaller ally, the Communist Party of India, or CPI, and their trade union affiliates, the CITU and AITUC. For decades, the Stalinists have functioned as an integral part of the bourgeois establishment and the most important social prop of the Indian bourgeoisie. The BJP rose to power by exploiting popular anger over mass joblessness and chronic poverty. But the Stalinists paved the way for this by supporting a succession of national governments, most of them Congress-led, that pursued neo-liberal “reform” and closer relations with Washington, and by implementing, in the states where they held office, what they themselves termed “pro-investor” policies. The Stalinists have responded to the intensification of the class struggle by lurching still further to the right. In the name of opposing the BJP, they are urging the working class to place its trust in the putrefying “democratic” institutions of the Indian state—the very institutions responsible for Tuesday’s massacre and the victimization of the Maruti Suzuki workers—and to lend its support to the Congress Party, till recently the Indian bourgeoisie’s preferred party of government, as well as a host of right-wing regionalist and caste-ist parties. The Stalinsts’ attitude toward the working class is exemplified by their hostility to the framed-up Maruti-Suzuki workers. Although employers routinely threaten workers with “doing a Maruti Suzuki,” the Stalinists are treating these class-war prisoners like the pariahs of 19th century South India, refusing to publicize their case, let alone mobilize the working class to fight for their freedom. This is because they recognize that a campaign linking the defence of the Maruti Suzuki workers to the struggle against poverty wages and precarious employment would blow up their alliance with the Congress Party and their unions’ cozy, corporatist relations with big business. In India, as around the world, the most urgent task is the forging of the political independence of the working class so it can advance its own program in opposition to social inequality, exploitation and war and rally the urban and rural poor around it in the fight for workers’ power and socialism. The central task in carrying out this perspective is the building of a new political leadership of the working class through the construction of a section of the International Committee of the Fourth International in India.